Though Reno, Nevada is at a high elevation, the area is considered temperate and has a growing season of more than 200 days, due to the influence of marine air that spills over the Cascade Mountains. Designated as Zone 7 on the U.S. Department of Agriculture Plant Hardiness Zone Map, Reno's climate is warmer and less volatile than surrounding areas. Root vegetables do particularly well in this area, as do tomatoes, if planted in summer. This area is quite dry during the summer, so pay special attention to keeping soil around vegetables moist. Carrots require loose, good-textured soil to produce vegetables with smooth skin. Because carrots have a short growing season--they may be harvested as little as 40 days after sowing--they are a good choice for Reno. Plant carrots at least 70 days before the first hard frost is expected. Plant carrots in full sun and in soil with a constant moisture level. Letting the soil dry out may cause the carrots to split. Carrots may also split if there is too much nitrogen in the soil, so check fertilizer for nitrogen levels and avoid using manure near carrots. Among the easiest crops to grow at home, potatoes may be started by planting a whole potato with eyes on it. If you've got a big potato with lots of eyes, cut it into 2-inch cubes and plant each one. Potatoes need sandy, loose, well-draining, rich soil so that the vegetable can spread and develop a smooth skin. Plant potatoes after last frost in full sun and moist soil. Most varieties take about 90 days from sowing to harvest. The vegetable will grow below ground, while the above-ground leaves resemble a tomato plant and may have pale blue flowers. For so-called "new" potatoes, dig plants up when flowers appear; for more mature potatoes, dig up potatoes when the tops die down. Plant tomatoes after the last frost and harvest before the first frost in Reno, as tomatoes fail to produce fruit when temperatures are below 55 degrees F. In particular, small tomatoes such as cherry varieties thrive because they set fruit faster. "Red Cherry" and "Yellow Pear" are good selections. "Red Cherry" produces small, round, red tomatoes, while "Yellow Pear" produces yellow tomatoes that resemble miniature pears. Tomatoes are also sensitive to hot weather and will fail to set if temperatures exceed 100 degrees F. Plants thrive in full sun, and roots should be kept moist. 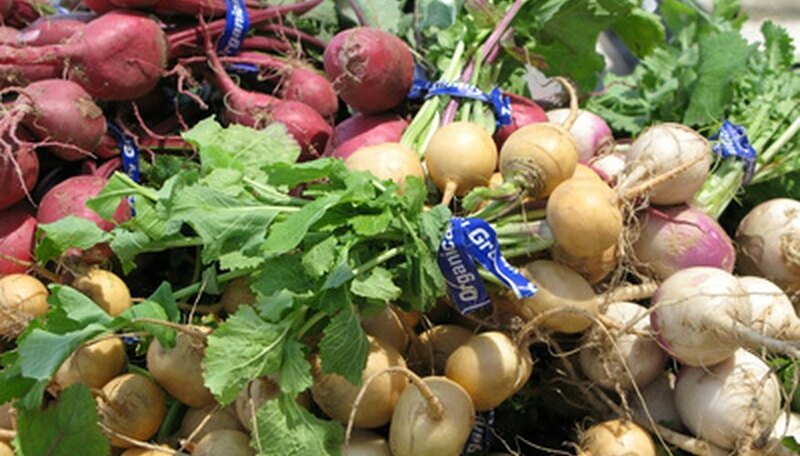 Another root vegetable that requires loose, well-draining soil, turnips are good cool-season crops and may be planted in Reno in early spring (after last frost) for a summer harvest or in summer for a mid-fall harvest. Both the root, which is round and white, and the greens on top are edible. Harvest turnips about 75 days after sowing. Keep the soil moist throughout the growing period to ensure mild flavor. Plant turnips in full sun. Which Vegetables Grow Best in 5b Areas? Which Vegetables Prefer Acidic Soil?